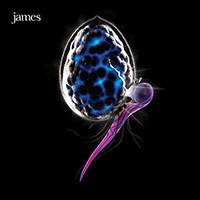 Earlier this year when James released The Night Before, the album catapulted James into the pantheon of artists that are even more alluring second time around. The Night Before seems fearless, a product, no doubt, of the way it was conceived: the band set up an FTP site to which they all contributed, downloading and updating each other's efforts at various intervals whilst Lee 'Muddy' Baker knocked things into shape. Tim explained to the BBC, "We improvised 30-minute songs then put them on a website and each band member could download them and work on them at home - reconstruct them, chop them up, arrange them, put their instruments on, do whatever they wanted. Then they could put it back on the website and someone else could take that and chop it up and do the same. A very Brian Eno-esque way of working. We worked with him for nine or 10 years and it filtered through." The results of this "virtual" recording process proved as diverse and intriguing as anything the band had attempted before. The Night Before is nothing if not intimate. Ten Below was inspired by Booth's memories of "surviving" a Welsh boarding school education where he spent a significant amount of time wearing hats and scarves under the bedclothes (he was "yellow" and suffering from jaundice) and listening to John Peel – who'd incidentally attended the same school. Crazy, the lead single, touches on a similar theme; Booth's liver disease actually got worse not better and he found himself hospitalised, wired up to oxygen and told that he had hardly any white cells left in his body. Throughout recovery (if life can be said to be recovery), Booth had been convinced that his physical frailty (which often produced hallucinations) meant that he was "crazy" and that sooner or later he would be exposed. (Imagine his surprise when he hit thirty and found he'd got away with it!) Ostensibly, both songs had a sense of triumph but it's surely true to say that if James had always written uplifting songs about insecurity, disaffection and mental illness, then these songs take the record to a whole new level.